"Produces amazingly realistic guitar parts." "Very easy to learn how to execute fluid, real-time performances." Kontakt 4 Player included - No sampler required! over 64 Giga-bytes*, approx. 123,000 samples. - All the five pick-up positions can be reproduced. - The lower note samples (low C - low D#) are included. * Amp simulator is not included in the product. 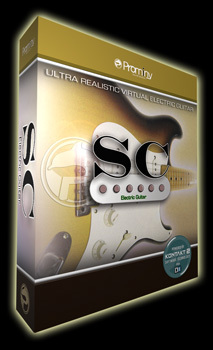 With SC SPM (Super Performance Multi), you can play ultra realistic guitar performance in real-time. SC SPM is more advanced, playable, and flexible. You can access the expansive number of the playing techniques instantly without stopping your performance and create convincing guitar tracks very quickly. We modified the Stratocaster®so we can record the three direct signals from the neck, middle, and bridge pick-up simultaneously via separate output jacks. Each sound of the pick-up microphones was perfectly sampled and all the five pick-up positions can be reproduced. You can also change the mix balance of each pick-up microphone. SC Electric Guitar reproduces even the switching noise of the pickup selector! SPM automatically selects a proper string / fret position depending on the situation. You can also change the string manually by key switches. The Fretboard Monitor visualizes the current fret position / playing technique you are playing. With SPM's Auto Stroke Detection feature, SPM automatically detects the current beat position and identify proper stroke direction (down or up). There are several stroke detection modes and you can also control stroke direction manually. The extensive number of the 'real' chord samples make your guitar tracks very convincing. - major, minor, 7th, minor 7th, major 7th , add 9th, 7th-9th, major 7th-9th, sus 4th, dim 7th, aug, #9th, minor 9th, major 3rd vibrato with / without picking harmonics, open chords, power chords (besides 5th-dyad chord), etc. Guitar chord sound which is emulated using single note samples does not sound real. SC Electric Guitar includes the huge number of 'real' recorded (in other words, 'pre-recorded' or 'pre-played') chord samples. Each chord instrument can be used as a SPM instrument and you can instantly access the various types of guitar chords. Prominy's guitar libraries are the only ones which include such a huge number of the 'real' chord samples. In actual guitar performance, you get feedback sound when a heavily distorted tone is played in front of (or a certain position from) the amplifier. SC Electric Guitar reproduces the feedback sound. The pitch and fade time of feedback can be changed. SC Electric Guitar includes a huge number of the guitar playing techniques, and most of them are available as SPM instruments. This is a technique which is frequently used in recording guitar tracks. It gives the guitar track a nice, wide-spread stereo images and thickness. With SC Electric Guitar, you can reproduce it very easily just by loading 'SPM double-tracking instruments'. No identical samples are played simultaneously in both channels. You don't need a stereo delay or tweaking your midi data to emulate the double-tracking. SC Electric Guitar includes the lower note samples (low C - low D#) and is suitable for a wide range of musical genres. Realtime Legato Slide feature using 'real' legato samples is available in single note, 5th-dayd chord, 4th-dyad-chord, and octave-dyad, and power chord instruments. With SC's Realtime Legato Slide feature, you are able to get perfectly real expressions of the human finger's legato slide which can not be reproduced with slide emulation by changing pitch. You can make your own guitar sound so it suits the music genre you're working with by adding your favorite amplifier simulator. Picking noises made while playing a guitar is one of the most important characteristics that identify a live guitar recording. That is why we took great care in capturing many variations of picking noises. Adding these noises, with consideration to timing and picking style, will make your guitar tracks sound natural. When you use picking noise sampled from a different position of the fret board than the one you're applying it to, the result is an unnatural sound because the noise will not harmonize with the original note's sustain sound. Single note, 5th-dyad chord, 4th-dyad chord, octave, power chords, vibrato, single bend, unison bend, stationary bend, double bend, legato slide, pinch harmonic, various chords, picking noises, whammy bar, special FX, etc. - Kontakt 4 Player included -No sampler required! "There is nothing else out there with this level of sophistication. The interface is easy to use and I was composing within 5 minutes after installing it!" "It's absolute magic for any composer who needs to add guitar to their work"
"The attention to detail and tonal quality is hands down the best I have heard.No one can believe these guitar parts are being played on a keyboard!!!" "You'll be blown away with the stunning and powerful guitar sound! Prominy offers hightop-class virtual instruments for any kind of musicians, songs and styles."